Volunteers take their positions at state parks up and down the Oregon Coast next Saturday to help visitors look for migrating gray whales during the annual Winter Whale Watch Week, Dec. 26-Jan. 1. The program, launched by Oregon Sea Grant’s Don Giles in 1978 and now coordinated by the Oregon State Parks and Recreation’s Depoe Bay Whale Center, draws thousands of winter visitors to the coast each year, armed with binoculars in hopes of spotting some of the giant marine mammals as they migrate south to their breeding grounds off Mexico’s Baja California. To learn more about whales and their migrations before you head to the coast, download the free Sea Grant publication, Gray Whales, from our Web site, in English and Spanish language versions, as a printable .pdf or a fast-loading text version. 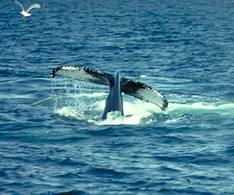 Also available: A Watching Whales fact sheet with tips for spotting the animals – and how to tell a whale spout from a wave – is also available. When you need to warm up, stop by OSU’s Hatfield Marine Science Visitor Center, open from 10 a.m.-4 p.m. every day of Whale Watch Week except Jan. 1 with special programs and activities, including a daily marine mammal program in Hennings Auditorium featuring hands-on baleen, skulls and other whale “biofacts”. The Center is also a great place to find out where whales are being seen – they’ll be keeping a running list of reported sightings and locations. For more information, including a list of parks where volunteers will be stationed, visit the Whale Spoken Here Web site.